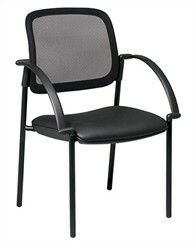 Seat upholstered in a durable black vinyl. Seat Size: 18-1/2"W x 19-1/2"D. Back Size: 17-1/4"W x 14-1/2"H. Overall Size: 24"W x 23-1/2"D x 32-3/4"H. Shpg. wt. 25 lbs. Ships unassembled. PRICE INCLUDES FREIGHT! Please allow 2 weeks for delivery.